This Instant Pot Chicken and Rice is easy, creamy and comforting. Mushrooms, onions and celery give it a ton of flavor and the recipe is full of real ingredients – no canned soup here! If you don’t like mushrooms you can use sliced carrots instead. Everybody needs a collection of Instant Pot chicken recipes. Most of us eat a lot of chicken and if you keep some pantry staples on hand recipes like this can save your life when things get crazy. More than 18,000 people a year are looking for “Instant Pot chicken recipes” on Google – we love our chicken! I keep a giant Costco box of Lipton Onion Soup mix in my cupboard. It is a simple collection of seasonings with great flavor that compliments most meat dishes. When I’m in a hurry I can toss a packet of this stuff in and not stop to measure out a lot of spices. I’ve never actually made the onion soup with the packet! I probably should do that some day but until then you can open my pantry and see a major stock pile of this stuff! There are quite a few different ways to make chicken and rice in the IP. I know cans of soup are popular ingredients here but I like keeping it simple and go with more basic ingredients. When you pick out a chicken and rice instant pot recipe make sure you get the right kind of rice that the recipe calls for. My version of this recipe takes 10 minutes to prep and 20 minutes to cook. I’m using an 8 quart IP which takes 35 minutes to come to pressure for this recipe. This Instant Pot Chicken and Rice is easy, creamy and comforting. Mushrooms, onions and celery give it a ton of flavor and the recipe is full of real ingredients - no canned soup here! If you don't like mushrooms you can use sliced carrots instead. This comes together quickly in the Instant Pot without a lot of prep. Add the chicken bouillon to the hot water and let it sit to dissolve. 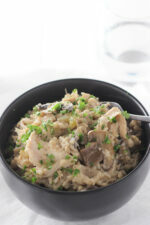 Place the chicken, rice, mushrooms, celery, and onion into the cooking bowl of the instant pot. Sprinkle the soup mix and black pepper over that. Whisk the bouillon and water together until no large chunks remain and pour over the rest of the food. Put the lid on the Instant Pot and set the bail on top to the sealing position. Set the Instant Pot for 20 minutes at high pressure. When the cooking time is complete do a quick release and then open the lid. Add the cream or sour cream and use two forks to shred the chicken into chunks. Stir until combined. Taste for salt / pepper and serve. Unfortunately different versions of the Instant Pot cook differently. 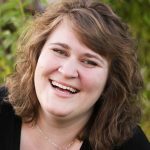 It has become a increasingly frustrating problem for recipe developers. These times work in my IP but may need adjusting in yours. I wish I could offer a better solution! Instant Pots are coming way down in price! If you don’t have one this is a great time to pick one up! I have two kids so we use the 8 quart which gives me flexibility to make a bigger batch for company or the freezer. If this is a recipe you love, check out these similar recipes I’ve created! Irish Chicken Pot Pie – this will warm you up on a cold day! Instant Pot Mac and Cheese – so creamy and decadent! Kids and adults love this one! Uncommonly Amazing Tuna Noodle Casserole – be surprised and just how good tuna noodle can be!